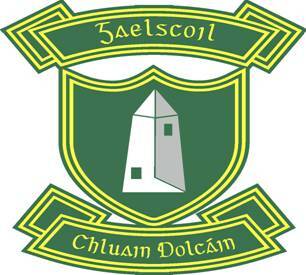 Tá defibrillator na scoile ar fail díreach taobh istigh de phríomhdhoras na scoile. Tá sé ar an mballa, i mbosca glas, ar thaobh na lámha chlé, idir phríomhdoras na scoile agus na doirse taobh istigh. The school defibrillator is available just inside the main door of the school. It is in a green box mounted on the wall, on the left hand side between the main door and the internal doors. Please familiarise yourself with it's appearance and location.